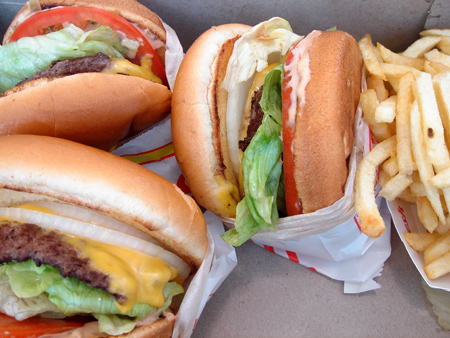 I was in LA last week, so naturally I had to have In-N-Out (pictured above). I've already made the claim previously that Shake Shack is better than the great In-N-Out and I was eager to see if I know what I'm talking about (since I made the claim without having eaten at In-N-Out in almost two years). I wondered if my taste memory is as sharp as I'd like to believe it is. In-N-Out's bun (well toasted, just like the Shake Shack) is bigger and the burger comes with more lettuce, but the beef patty is much thinner and is basically nuked. And, yes, I know I could have gotten a Double Double but I'm comparing single patty burger to single patty burger here. In any case, I don't usually like multi-patty burgers, the meat-to-cheese-to-bun ratio tends to get out of wack. Shake Shack's beef patty is more than twice as thick and you can tell it's made from superior beef even if you were never told that their patties are freshly ground daily from sirloin and brisket. You could literally smell the beefy goodness from a block away. It's also cooked properly to medium doneness, with the inside still showing pink. The Shake Shack bun is smaller and softer and comes with a single fresh slice of lettuce (both In-N-Out and Shake Shack come with a single slice of tomato). Smaller bun+less lettuce+much bigger beef patty = a vastly superior meat/cheese-to-bun/lettuce/tomato ratio. The Shack Burger cost more than twice as much at $3.95 $4.16 (did they raise their prices since April?) but it's worth every penny. I think it's more than twice as good. You West Coast folks better avoid the Shake Shack when you're in NYC because once you try it, you'll never again be satisfied with In-N-Out. You are forewarned!